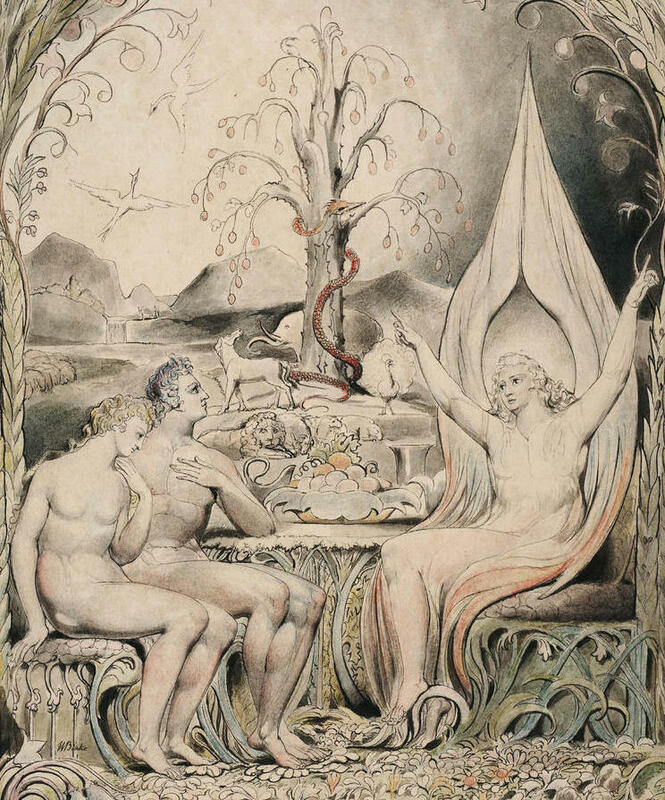 William Blake, Raphael Warns Adam and Eve (detail), 1808. There were many trees in the garden, each lovely to look at and good for food, but two trees at its midst were particularly notable: the tree of life and the tree of knowledge, good, and evil. God told the human that he could eat the fruit of every tree in the garden, but He commanded him not to eat of the tree of knowledge, good, and evil: “For on the day you eat from it, you are doomed to die.” The human listened and grasped that something very important was being told to him, but it was only after the divine words had faded away that he realized he had no idea what the words “doomed to die” meant. He told himself to ask God for a proper explanation the next time he saw Him. There were many trees in the garden, each lovely to look at and good for food, but two trees at its midst were particularly notable: the tree of life and the tree of knowledge, good, and evil. God told the human that he could eat the fruit of every tree in the garden, but He commanded him not to eat of the tree of knowledge, good, and evil. The human understood from these words that he was allowed to eat the fruit of the tree of life, which indeed looked quite appetizing. But he had already just sated his hunger on the first few nondescript trees he had come upon, and for the moment he had no desire to eat another thing. He told himself to try the tree of life very soon. There were many trees in the garden, each lovely to look at and good for food. God told the human that he could eat the fruit of every tree in the garden, but He commanded him not to eat of the tree of knowledge, good, and evil. Adam heard the chilling words and understood them. But as soon as the sound of the words died away, he realized that he had no idea which of the innumerable trees in the garden was the one whose fruit he had been warned not to eat. True, all the trees were not perfectly identical, but there was nothing so obvious about the forbidden tree—nothing so striking in its bark or its girth, or the flowers that it bore or the color and shape of its fruit—to fix it forever in his memory. He looked around, and in every direction there were trees, all of them beautiful and inviting. He stared up at the fruit that each of them bore, and he was hungry and afraid.